X17 News - Upcoming James Bond Flick Reportedly Titled "Skyfall"
Upcoming James Bond Flick Reportedly Titled "Skyfall"
LOS ANGELES, California (X17online) - The 23rd James Bond flick will reportedly be titled "Skyfall." According to Fusible.com, Sony Pictures and MGM have registered a number of website domains that indicate the name of the upcoming flick, including JamesBond-Skyfall.com and Skyfallthefilm.com. 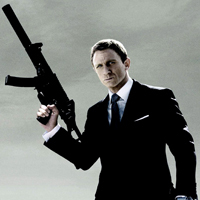 Daniel Craig will reprise his leading role of James Bond in Skyfall, which is scheduled to hit theaters in November 2012.